1 | August | 2018 | Edimentals ! 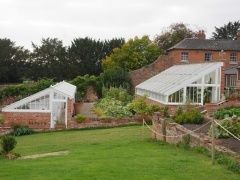 The Walled Gardens showcase the fully restored melon and cucumber house and the peach and fig house, alongside the converted vinery house. The foundations still remain from the original tomato house, forcing beds, pineapple pits, and orchard house all which will be restored in years to come.